You often hear people object to being scanned because of the "radiation" argument. I find this always quite amusing from people just being exposed to higher radiation levels during the average airplane flight. I once read a article on the levels of being exposed to radiation in everyday live, but I lost the article. I remember that the exposure in planes was quit substantial. Somewhere in the order of one body scan is equal to 10 minutes of your average transcontinental flight. So my question is, to how much more radiation are you really exposed while traveling in an airplane, compared to staying on the ground? The amount of radiation you're exposed to on an airplane flight depends on a variety of factors, including the altitude, latitude, and duration of the flight. As an example, a flight from New York to Tokyo is probably about 150 μSV. 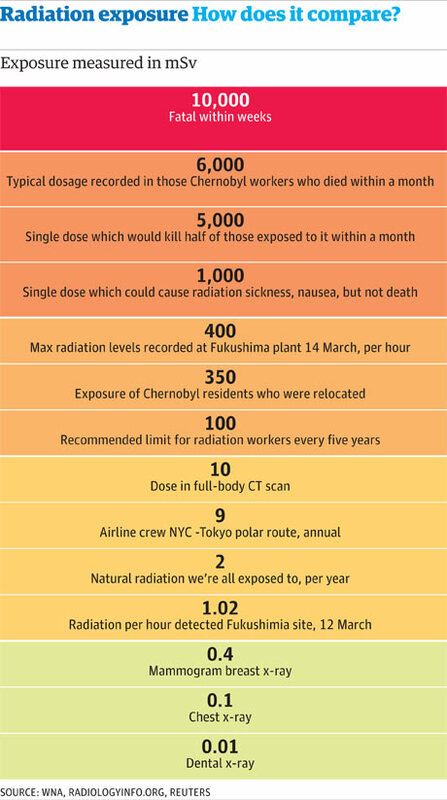 For comparison, natural background radiation is about 2,000-7,000 μSv per year, a chest x-ray is about 50 μSv, and a medical CT scan is about 10,000 μSv. Some of the other answers have referred to the BED (banana equivalent dose), but unfortunately the BED is scientifically wrong, because the body maintains a constant amount of potassium, so ingesting more doesn't increase your exposure. The question asked about the comparison with the radiation exposure from airport scanners. There are two types of full-body scanners, backscatter x-ray and millimeter wave. In the US, the TSA is eliminating all backscatter x-ray scanners by June 2013, so the only type remaining will be millimeter wave scanners. Millimeter wave scanners do not use ionizing radiation, so the radiation exposure is zero. I assume backscatter x-ray machines will continue to be used in airports in at least some other countries; the radiation exposure is about 0.05-0.1 μSv per scan, which is about a thousand times less than exposure during the flight. There is strong evidence that small doses of radiation do not cause even a small negative health effect in proportion to the dose (which would be the LNT, linear no-threshold hypothesis). In fact, there is quite a bit of evidence that small radiation doses provide a health benefit, an effect called radiation hormesis. This may be because the radiation activates cellular repair mechanisms. However, the dose received from an airplane flight is much too small to provide any positive or negative effect worth considering on an individual basis. 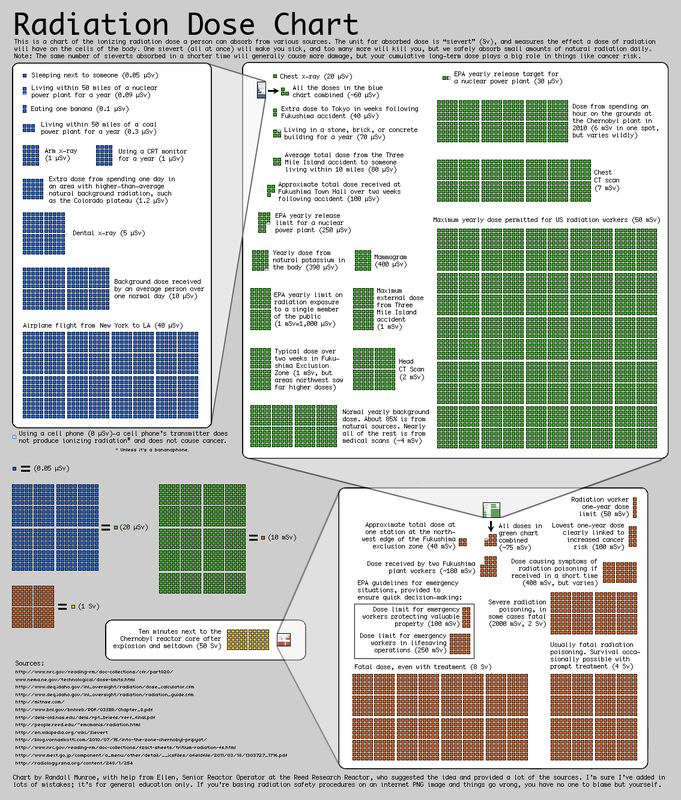 XKCD has an excellent visualization depicting these doses, including the BED! You can find a very nice article about radiation exposure while flying [here] on airspacemag6. You can calculate the radiation you're exposed to, during a flight, here ,by giving departure and arrival cities. flying from London to New York is equivalent to 400 BED (additional information). As a physicist who worked for many years on the backscatter imagers, I can assure you the dose to the skin is very low. It is required that there be at least 1mm of aluminum filtration equivalent in the beam to remove the very low energy x-rays that would increase dose to the skin. Are there any good radiation measurement devices to recommend when traveling to places with high radiation? What happens if you become seriously ill during a flight? How to vomit during a flight?